Adjustable dumbbells are a great option when space is limited and budget is a concern. They are compact dumbbells that take the place of entire dumbbell sets, but with a smaller footprint and smaller price tag. Adjustable dumbbells can range from 5-25lb sets to 5-50lb sets and beyond. The weight is adjusted by "selecting" the amount of weight you want to lift with a dial or pin selector. 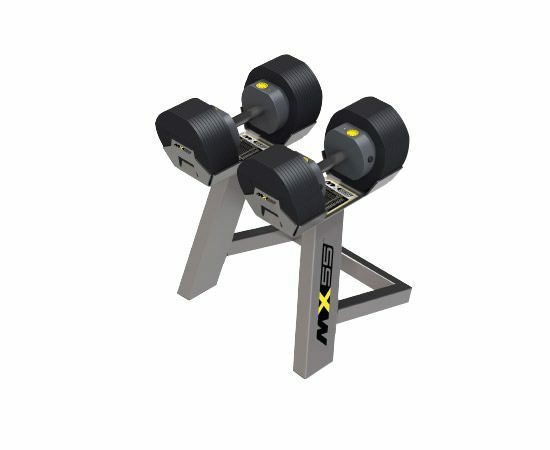 When combined with a stand, you have a complete dumbbell set that fits in a same space that a normal pair of dumbbells take. Add an adjustable weight bench and you will have an efficient and effective workout station that fits in the corner of a room.